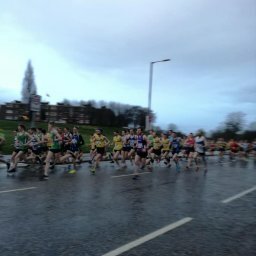 Although the main event this week was North Belfast Harriers’ own, Laganside 10k, there were plenty other events to keep our intrepid runners busy throughout the week. 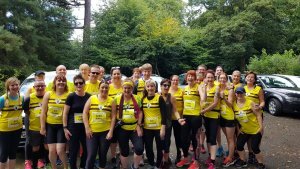 On Wednesday EAMS staged their August Midweek Marathon with runners starting at Carrickfergus castle and running 3 loops to the Loughshore Park at Jordanstown and back. In bright and mild conditions with a prevailing southerly wind Simon Reeve took 2nd place and Greg McClure 4th. The club was represented by Jason Reid. Eimear Nugent represented the Harriers in this 5k race situated in Magheralin Co Down. The course is a 4.2 mile loop on trail. Runners start at 12 noon and have 1 hour to complete the 1st loop and be at the starting line ready to go again at 1pm. then again at 2pm and so on. Any runner not finished their loop and at the starting line ready to go again will not be allowed to continue. This goes on until there is only 1 runner on the course and this person will be the Last One Standing. Our own Coleen Thompson managed 20 loops (84 miles) and was the second female standing. Outstanding! The 37th Waterside Half Marathon returned to The Maiden City. 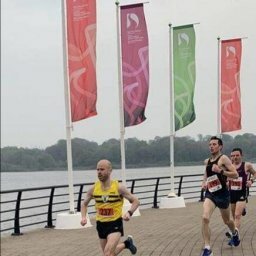 Starting in Ebrington Square, the route took runners across the river to the cityside, showcasing parks, greenways and bridges before finishing at St Columb’s Park. Andrew Annett came second securing a podium position. 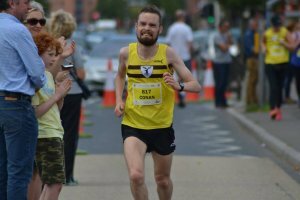 Andrew was crowned Northern Ireland & Ulster Champion at the Waterside Half Marathon. Many congratulations Andrew! 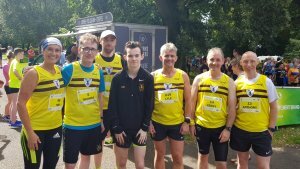 There was a carnival atmosphere in Ormeau Park for the North Belfast Harriers’ annual flagship race, the Laganside 10k which is part of the Novosco 10k Grand Prix. Well over one thousand runners lined up, including 95 Harriers, and despite the sticky heat, they clocked up some impressive times. 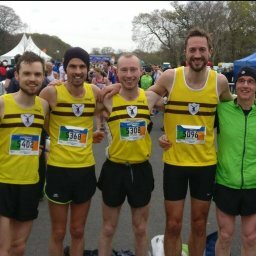 Conan McCaughey led the Harriers across the finishing line with Gladys Ganiel taking the title for the ladies. 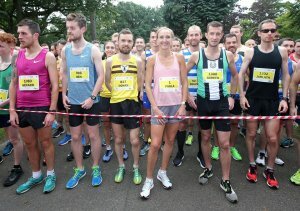 Paula Radcliffe, Marathon World Record holder and former BBC Sports Personality of the Year was guest of honour at the event. Paula took the time to speak to many runners and spectators alike and posed for many photographs and selfies. Paula, running with bib number 1, finished the 10k in 42:35. Her PB for that distance is 30:21 set in 2003. Our thanks goes to Matt Shields for organising this event. No fewer than 53 North Belfast Harriers were represented across 12 parkruns this week, with two runners achieving PBs. 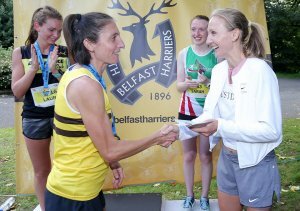 Congratulations to Roisin HUGHES who won the Falls parkrun, Stephen WALKER who won the Falcarragh parkrun & Helen F WEIR who was the first lady home in the Larne parkrun. Matt Shields took part in the inaugural Progressive parkrun within the confines of Mountjoy prison, Co. Dublin. 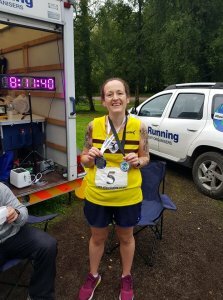 205 Roisin RODGERS 00:48:51 New PB! 1 Roisin HUGHES 00:21:09 Winner! 6 Helen F WEIR 00:22:26 First Lady! 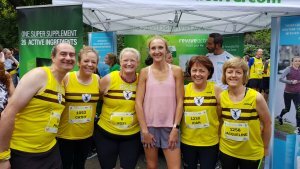 25 Clare HOLMES 00:24:21 New PB! 1 Stephen WALKER 00:17:42 Winner!